Select compatible sensors, analyzers, flow cells and accessories from the items listed on this page. Systems used for regulatory reporting may require a colorimeter using the DPD Method. Our staff is happy to help you configure the correct system for your needs. Measurement ranges: 00.00 to 02.00/05.00/10.00/20.00 ppm Cl2./ ClO2 / O3. Resolution 0.01ppm. Accuracy ± 0.5% f.s. Graphic display to visualise simultaneously: measurement, temperature, analog and digital outputs (set point) condition, alarms. Internal data logger (16.000 records). Tabular or graphic stored data display with maximum, minimum and average values. Programming key pad with 5 keys. Function keys for direct access to the calibration menu and to stored measurement graphs. PID regulation to be set for analog or digital output (PWM or Frequency). Two digital Outputs to be set for set point, with programming of working range and activation time. Digital output for Alarm: minimum, maximum, delay of the set point, residence time (live check), malfunction. Digital output to be set for: Temperature set point or to control the rinsing cycle of the electrode with time and interval programming. 0/4 to 20mA primary output with programmable limits within the measurement range. 0/4 to 20mA secondary output programmable for: temperature/meas. repetition/PID function. RS485 serial output with MODBUS RTU protocol. Able to simulate outputs via a keyboard. Graphic display LCD STN 128x64 back-lit. Same technical features as for 4293. Grey ABS case for panel mounting. Same technical features as for 4293 but LCD STN 57x30 back-lighted graphic display. Automatic temperature compensation . Graphic display to visualise simultaneously: measurement, temperature, analog and digital outputs condition, alarms. Programming key pad with 4 keys. Function key to direct access to calibration menu. PID regulation to be set on digital output (PWM or Frequency ). Two digital Outputs to be set for set point, with programming of working range (hysteresis/direction) as well as of the activation time. 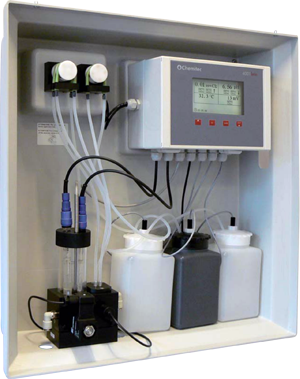 Digital output to control the rinsing cycle of the electrode with time and interval programming. 0/4 to 20mA primary output with limits that can be programmed within the measurement range. Able to simulate the outputs via a keyboard. Graphic display LCD STN 128x64 back-lighted. 4 keys programming keyboard. Same technical features as for 3593. Grey ABS case for panel mounting . Same technical features as 3593 but LCD STN 57x30 back-lighted graphic display. Select the Chemitec amperometric membrane sensor that matches your disinfectant, measuring range and pH conditions. Measuring ranges 0 to 2.00mg/L - pH application range 1 to 14pH. Measuring ranges 0 to 2.00 mg/liter - pH application range 1 to 14pH. features as S494/2/CL2 but wth pH application range 4 to 12 pH. S494/2/CL Org Organic Free Chlorine, 4 to 12 pH. Same features as S494/2/CL2 but wth pH application range 4 to 12 pH. Same features as S494/2/CL2 but wth pH application range 6.5 to 9.5 pH. The 4001-series Photometric Analyzer employs the DPD method to determine the concentration of free chlorine, total chlorine, chlorine dioxide, ozone, peracetic acid, bromine, permanganate. etc. Photometry provides a quantitative measurement of organic and inorganic compounds based on colorimetric characteristics. Chemical reagents create linear color intensities proportional to the concentration of a substance at a known, visible wavelength in the visible spectrum (400 to 800nm) with few interfering substances. The differential measurement is processed and transformed into a concentration value, through the use of specific correlation tables developed in our laboratories. The controller displays the measurement in mg/l to control dosing. The 4001-series running costs and maintenance are very low and calibration is carried out automatically with each measurement cycle. Industrial applications include the analysis of drinking water, wastewater, and aqueous streams in the processing of food, pharmaceuticals, chemicals, etc. Resolution: 0.1°C - Accuracy: 1% f.s. Digital outputs: condition, storage condition, malfunctions. nr. 2 for Chlorine + 2 for pH - Programming of Hysteresis and operational time: 000 to 999 sec. Analog Input 0/4 to 20mA for auxiliary measurements - MODBUS RTU protocol with programmable velocity 1200 to 38400 Baud Rate for set-up, Real Time condition, or data download.